SINGAPORE - There is a stall called Sedap Goreng, which sells all kinds of fried snacks, in the retail space of the National University Hospital Medical Centre. Its name loosely translates from Malay as "delicious fried" and the food certainly lives up to that. 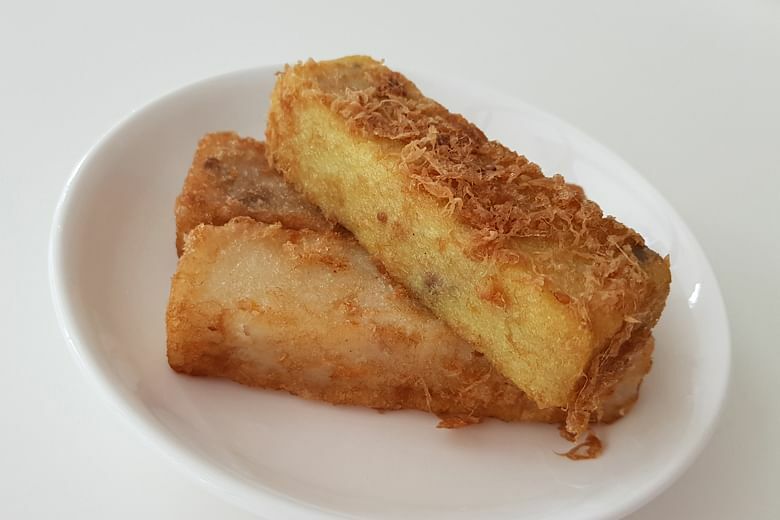 Take its deep-fried soon kueh ($1.40 for one, or $4 for three). It would have been perfectly good steamed, but when passed through hot oil, it takes the pleasure of eating the kueh to a whole new level. The kueh's translucent skin is bouncy and the deep-frying gives it a charred crustiness. Its rich and generous filling, which includes julienned black wood-ear and carrot, and minced dried shrimp, means it's at once crunchy and chewy. My other favourites from this stall are its carrot cake, yam cake and pumpkin cake (60 cents each, or $1.50 for three), which are in oblong strips, rather than the regular square, to make it easier to eat on the go. I especially like the peppery yam cake, which is pleasingly firm, has generous bits of yam and is made fragrant with dried shrimp. The carrot cake on the other hand, is tender and has a strong flavour of radish, unlike lesser ones which can taste more of flour and not much of radish. The pumpkin cake could come across as bland in comparison to the other two, but what it has going for it is that it is covered with wisps of egg floss, which gives it a nice texture. This stall also sells an interesting disc-shaped bean kueh ($1 each), which is known colloquially in Chinese as a "pig trotter round" for its resemblance to its namesake. This traditional kueh, which I last ate when I was a child, is a spongy, savoury kueh that is studded with black-eye beans and a sprinkling of bean sprouts. A refreshing hint of cilantro completes the taste. These kueh sell out fast, so if you see them, be quick about it and don't dither thinking about calorie counts - they are worth using up your quota of deep-fried food for the week.